Inside the cabin, you’d be treated with sheer opulence. The materials, the build quality and the features, all collectively take you momentarily to a different world, precisely in the world of Proton X70. While the standard fabric seats are good to comfort you, the premium Nappa leather seats take comfort to a new level. The Standard X70 gets fabric seating, the Executive trims get leatherette seats and the Premium X70 features Nappa Leather. The dash looks quite upmarket with silver finishes. The doors and speaker panels get wood garnishing that enhances the overall appeal of the cabin. There is a multi-function flat-bottom steering wheel with controls mounted on it. The centre console features an 8-inch infotainment system with 6 USB ports, voice command support, Bluetooth, navigation and built-in e-SIM functionality for on-the-go connectivity. Proton likes to call it a GKUI infotainment system powered by Android. For a detailed vehicle information, the company has added a fully-digital multi-info display that provides all the necessary details about the vehicle to the driver. Talking about the features, the X70 gets a dual-zone climate control, tyre pressure monitoring system, a panoramic sunroof, power adjustable driver seat, rearview camera and a live feed from 360-degree cameras. Keeping in mind customers’ diverse taste, the X70 is available in three interior options that include black fabric, black leatherette, and brown Nappa leather. As said, the new Proton X70 resembles the Geely Boyue but to a certain extent. The Proton designers have done a commendable job to incorporate Malaysian details. Up front, it gets a unique ‘infinite weave’ pattern on the grille whose design cues have been taken from the Malaysian wood carvings. The chrome-garnished grille is flanked by LED headlamps with daytime running lights that do not come as standard. The standard X70 gets halogen headlamps. The muscular structure of the Boyue is something that you see on the X70 - features prominent wheel arches over 18-inch alloys (17-inch are available with the base variant), wide D-pillar look, panoramic sunroof, and slim LED wrap-around taillights. The SUV looks even more enticing with the colours it wears. There are a total of five colours available, including Jet Grey, Armour Silver, Snow White, Flame Red, and Cinnamon Brown. The Flame Red, which the company promotes more than any other on the list, is available only with the Premium 2WD variant. The Proton X70 draws power from the four-cylinder, TGDi turbocharged 1.8-litre petrol engine that churns out a max power of 183.5 PS and a peak torque of 285 Nm at 1,700-4,400 rpm. The engine comes coupled to a 6-speed automatic transmission that benefits from the manual mode as well. The Proton X70 is available in both the drive system options, FWD, and AWD. It is claimed by the company that the front-wheel-drive X70 can travel from nought to 100 kmph in just 10.5 seconds. As far as fuel economy is concerned, the X70 is claimed to return a combined fuel efficiency of 12.8 kmpl. To keep occupants safe, Proton has incorporated the X70 with 6 airbags and Electronic Stability Control (ESC) as standard. For enhanced safety, the Proton X70 comes with the Advanced Driver Assistance System (ADAS), which is an exclusive safety suite with features like Adaptive Cruise Control, Blind Spot Monitoring System, Intelligent High Beam Control, Lane Departure Warning and Autonomous Emergency Braking. The Geely Boyue, which forms the basis for the X70, scored 5-star rating in the China NCAP crash test. This makes it evident that the Proton X70 will also be a robust offering. 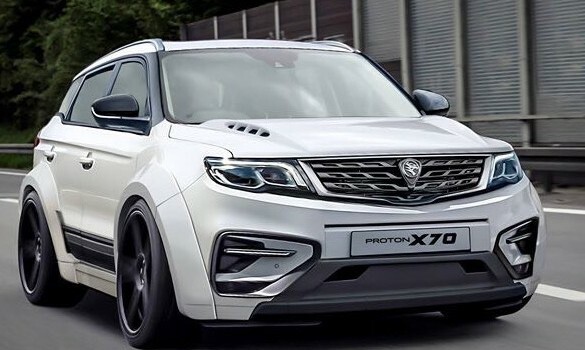 Proton X70 is a new offering in the compact SUV segment, which not only comes with a new design, it is also packed with segment-leading features. So, if you are looking for a profound ride with a leading brand's reliability, the X70 should be the right choice in the respective segment.